Description - These recycled rubber playground tiles are made in the US and are designed to keep kids safe when playing on jungle gyms, swing sets, and other playground equipment or athletic areas. These playground surfaces are available in solid black, red, grey and green offering an eye-catching look with superior shock absorption, long-term durability, and easy maintenance. 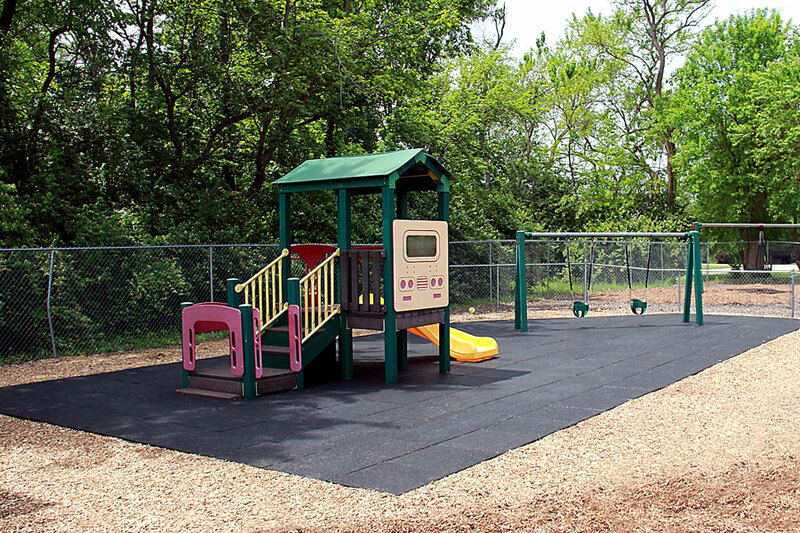 This rubber playground surface exhibits excellent resistance to weathering and aging and helps to ensure the safety of children from different fall heights. They also provide a clean and safe alternative to wood and playground rubber mulch. 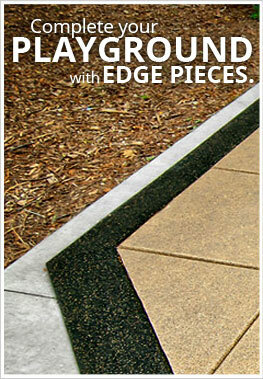 This playground surface can be used indoors as well as outdoors and, when installed correctly, provide proper drainage. Material – Our pigmented playground rubber tiles are composed of high-quality recycled SBR bound with a wear and weather resistant pigmented polyurethane. Note – Some minor color variation among traditional pigmented tiles is unavoidable. 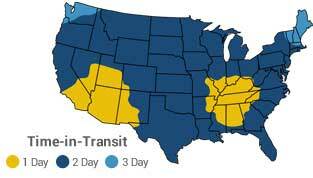 Pigmented tiles will fade in direct sunlight overtime and can potentially bleed. The warranty on these tiles will not cover color fading and bleeding. Size – Each tile is 24" x 24." See below for dimensions of accessory options. Recommended Uses – These tiles have been used successfully in school and park playgrounds, in community playgrounds, in skateboard parks, climbing walls, community play areas for children, as decks and patios, on rooftops, in day care centers, as indoor and outdoor walk ways and paths, and any other place where a fall absorbing playground or general rubber surface would be beneficial. Quad Block is 8" x 8"
2.5" reducer is 48" x 8"
2.5" ADA ramp is 24" x 24"
2.5" L/R side reducer for ADA ramp is 24" x 8"
2.5" outside 45 deg. corner reducer is 16" x 8"
2.5" inside 45 deg. corner reducer is 12" x 8"
2.5" outside 90 deg. corner reducer is 16" x 8"
2.5" inside 90 deg. corner reducer is 24" x 24"
To clean and maintain our pigmented playground tiles, a routine cleaning with a power washer (not to exceed 2000psi) or scrubbing machine and mild detergent (non-petroleum base) will maintain an attractive and long-lasting appearance. Note: Do not use any solvent or oil style cleaners such as Pinesol, Lysol, Murphy’s Oil Soap, WD40, paint thinner, etc. as these types of cleaners will break down the outdoor playground rubber surface over time. When installing 2.5" thick Jamboree playground tiles, one quad block connector is recommended for every one Jamboree tile purchased. For more detailed Jamboree rubber playground tile instructions, please Click Here. 2.5" ship in 1-2 bus. days. Water Permeable for proper drainage. Excellent traction wet or dry. I'm planning on buying the 2.5 inch Jamboree tile for about 1000sq area. Can I install it over compacted dirt? Our Jamboree Playground Tiles can be installed over compacted dirt or gravel with the use of quad blocks. These installation accessories are recommended for this thickness of tile. We would like to install this on the bathroom/shower floors in our cabin. It can be very damp because it's a small area. Would the 2.5 in tiles allow for proper drainage and can these be cut to size? Our Jamboree Playground Tiles are porous and allow water to flow through the tiles. So they will drain properly in your shower. We also do offer a wide range of shower tiles that you may be interested in on our drainage tiles page. Our Jamboree tiles can be cut to fit with the use of a large bread knife or band saw. How do you recommend to install reducers and corners for 2-1/2" tiles? How to fix it in place? There is no way to use Blok connectors, so I am stuck with it. To adhere the ramps and corners you will want to use our polyurethane glue or seam sealer. Just apply the glue to the side that butts up to the tile, press and hold and the ramp and corners will bind to the floor. We are looking for something to place under a pool for our toddler. Unfortunately, our backyard has more concrete than grass and with 4 dogs, we do not want her on the grass in the backyard for obvious reasons and don't like the lack of privacy in the front yard. We let her splash around in a blowup pool, but she likes to get out now and then - so we need something under and around the pool so if she falls, she will not get hurt. Our Jamboree Playground Tiles work perfectly for this application. Our Jamboree Tiles have a fall height rating, so if your little one were to fall, they would not be seriously hurt. Another great fact about our playground tiles is that they are made from rubber. Rubber is more slip resistant than concrete, and when wet, rubber becomes more slip-resistant making it the perfect flooring option around water. If the flooring were in direct sunlight, we would recommend going with a color other than black. Is this easy to take up? We would probably want to take up yearly to clean and disinfect sufficient underneath since this would be inside a bathroom. Our Jamboree Playground Tiles can be easily removed and replaced. Best deal I found online. I am the ultimate price shopper so I was checking with anyone and everyone I could find for some of these playground rubber tiles to install in our community park without having to eat up too much of our HOA budget for the year. Rubber Flooring Inc got me the best deal, had excellent service and communication during the entire process, and the playground surface looks even better than I imagined. Great doing business with you. Installed these in my backyard. They are fantastic for the kids to play on. They offer the cushion they need to accidental falls and are very attractive looking in the yard. Took a little time with install but very much worth the effort! I have had these tiles for about a year now and they have been through hell and high water. Right after I installed them we had some pretty bad storms roll through that had some large hail and the tiles held up well. The tiles also have held up well to the sun and to some snow. Even after all of that, the tiles look pretty like they are new. There was a little fading, but not much that anyone would really notice. But other than that they are pristine. They are also really easy to clean. Just sweep and hose down. Great tiles.